Forest ecology and management require both for research and for the development of sustainable and transparent strategies reliable information and data on the spatial composition of the multifunctional resource “forest”. Established inventory strategies which basically rely on terrestrial field measurements are increasingly supported by Geoinformation technologies (remote sensing, GPS, GIS). Current research activities are working towards the development of methodologies for single tree delineation and data acquisition by using Airborne Laser scanning (ALS) and high resolution multi-spectral satellite imagery. The quality and reliability of these approaches are, however, often limited by the insufficient spatial resolution and accuracy of the reference data required for the calibration and validation of the spatial models. 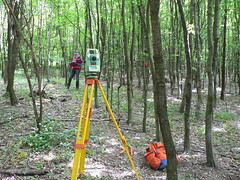 The project Forest-Check specifically focuses on this deficit of inaccurate and coarse reference data: scholars specifically trained by forest experts and scientists will carry out standardised forest inventories on a dense unified sampling raster throughout the model region ‘Vorarlberg’ and measure and analyse a number of single tree attributes and forest parameters which can be used for model development and validation. The field campaigns will produce the exact location and delineation of single trees and will also provide small-scale estimates of forest stock. The project will also allow for the comparison of different inventory methodologies (angle-count sampling vs. complete enumeration) and for assessing the potential of collaborations between schools and science in the field of forest ecological research.